The results of a clinical trial conducted in the United Kingdom with UROMUNE have been published in the BJUI (British Journal of Urology International). UROMUNE-MV140 is a polybacterial mucosal vaccine indicated for the prevention of recurrent urinary tract infections (RUTIs) developed by INMUNOTEK. Bladder infections (cystitis) are among the more frequent recurrent infections in women requiring the continuous use of antibiotics. 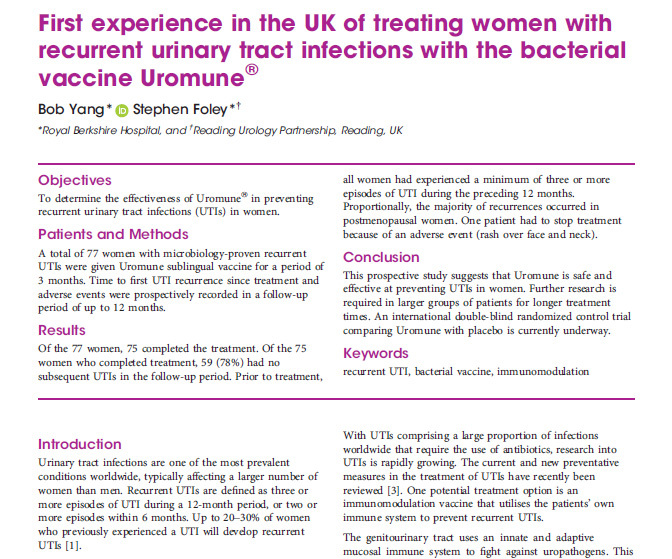 The results of this study in 77 women suggest a high degree of clinical efficacy for UROMUNE-MV140 administered sublingually during three months. These results support previous studies performed in Spain.